Please let our sponsors know you appreciate their support of the Corn Harvest! 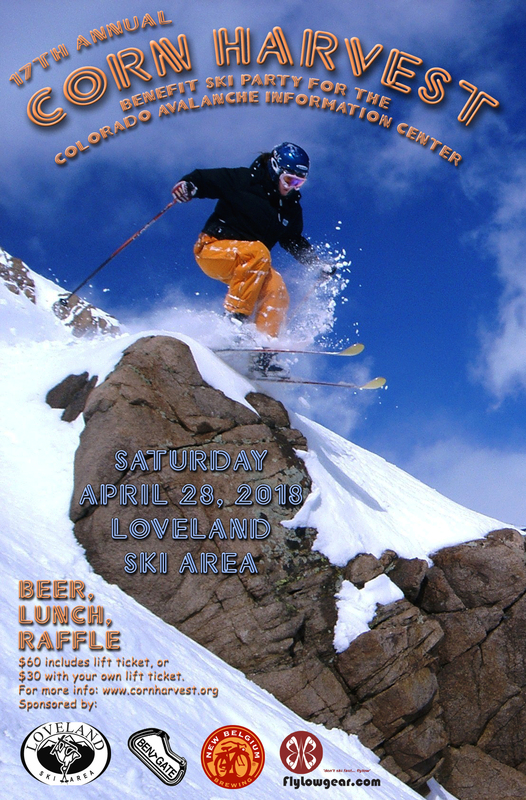 For the seventeenth year, Loveland Ski Area hosts the Corn Harvest benefit, and whether it's sunny and corn snow, or stormin' and powder, the skiing is gonna be great! Kegs of beer for the after-ski deck party are again donated by New Belgium. Woohoo! Bent Gate Mountaineering in Golden, knowledgeable staff and a great selection of gear and clothing. Flylow Gear makes cool clothing and outerwear for telemarkers. Great Range Bison offers all natural, grain fed USDA bison meat products, and they again are donating bison burgers and brats for the Corn Harvest lunch. Colorado's grassroots backcountry enthusiast fundraiser ski party! Web site by BTJ Design. Join us for the 17th Annual Corn Harvest on Saturday, April 28, 2018, to raise funds to help support the Colorado Avalanche Information Center. Meet and ski with some of the folks from CAIC, and show your support by letting them know the Colorado backcountry community appreciates their efforts to help us stay safe. $30 if you already have a pass or ticket.